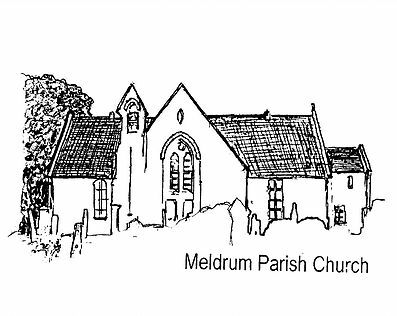 In 1684 the Parish centre moved to a new church in the village, now small town, of Oldmeldrum and the present church has served the community well for over 300 years. During the second world war the building was used as a storage area, the congregation meeting in another church in the village. In 1954 it was extensively reformed and refurbished and later became the only Presbyterian church in Oldmeldrum, the former Free Church on the main A947 Albert Road becoming (and continuing to be) the church hall. In 1984 a cairn was erected at the entrance of the church to commemorate 300 years since it was built, the stones being brought from the Auld Kirk at Bethelnie. Many have asked what the Latin inscription Ardens sed virens means. It means ‘Burning but Flourishing’, an allusion to the burning bush of Exodus 3:2. The same passage is the basis of the motto of the Church of Scotland of which we are a part, Nec tamen consumebatur – ‘Yet it was not consumed’, A stylised depiction of the burning bush is the symbol of the Church of Scotland (seen here). In 2003 a projector screen was installed on the wall behind the pulpit and other digital screens added later to allow the use of multimedia in services.